Question: How do fly shops come up with their prices? I notice that most of the good stuff is never on sale. How does a fly shop then set its prices? Manufacturer X makes a fly rod that it believes should sell for $100. So they offer the rod to fly shops for $60 (plus shipping). Thus, the fly shop owner makes a little under $40 every time they sell that rod for $100. That’s a 67 percent markup (40/60=.67), which is considerably less than the 100 percent markup (in which a product is sold for twice the wholesale price, also known as “keystone markup”) that is standard in some retail businesses. However, if a fly shop is willing to buy in volume or to pay up front, they can get an even better deal. So, although 5 rods will cost you $60 each, 20 rods might cost you $58 each, and 100 rods might cost $55 each. This system rewards larger retailers and those with ready cash because they help manufacturers move inventory and maintain cash flow. So your local fly-shop owner pays more for his name-brand rods than do Cabela’s or Bass Pro Shop. You would think that, if a retailer paid less for an item he could then sell it for less that the competition, right? Wrong. Almost all manufacturers of big-ticket fly-fishing items require that retailers sell the products for something close to the manufacturer’s suggested retail price (MSRP). This is a way for companies to ensure that their brand is not devalued, to avoid price wars among dealers, and to help keep big boxes from pulling a WalMart and driving the little fly shops out of business. Although some shop owners chafe at these kinds of rules—and some might actually doubt the legality of this kind of price control—the system may help keep the retail portion of the industry more stable. (You do want your local fly shop to stay in business, don’t you?). 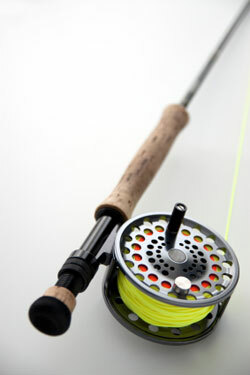 When you do see rods or reels on sale, they are usually discontinued items or the shop itself is going under. Shops caught discounting new gear run the risk of being dropped as a distributor. It’s important to note that fly shops are not usually high-volume operations, so they need good profit margins to stay in business. Almost nobody gets rich owning a fly shop, so don’t go blaming the guy behind the counter if you think his gear is too expensive. When I travel to northern Maine every year, I always stop in at what I call the “Tiffany’s of fly shops” and buy a few overpriced flies and tippets. The combination of the shop’s remote location and the short fishing season on local waters means that the owner has to survive on about four months of business. I’m willing to drop a few extra bucks because I’d hate to go up there and find that there is NO fly shop within fifty miles. I consider it an investment in my own angling experience.